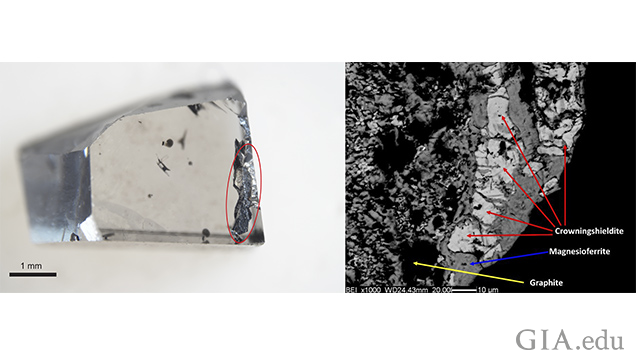 The left image shows a diamond sample that contains the newly recognized mineral crowningshieldite, in the dark area circled in red. The sample is an offcut from a larger type IIa diamond from the Letseng mine, Lesotho. The right image shows an enlargement, using an electron microscope, where individual grains of crowningshieldite are seen in a fine grained mixture with other minerals. Photo credits: Evan M. Smith (left image) and Fabrizio Nestola (right image). CARLSBAD, Calif. – Oct. 9, 2018 – Researchers at GIA, in collaboration with researchers at the University of Padova, recently discovered crowningshieldite, a new mineral named in honor of G. Robert Crowningshield, a pioneering figure in gemological research for more than 50 years at GIA. Crowningshieldite was discovered as an altered inclusion in two diamonds from the Letseng mine in Lesotho. GIA Research Scientist Dr. Evan M. Smith publicly announced this new mineral at GIA’s annual research meeting and presented it at GIA’s International Gemological Symposium on Oct. 8. Crowningshieldite was accepted as a mineral on Sept. 18 by the International Mineralogical Association. Smith and his team of researchers discovered crowningshieldite while examining inclusions in CLIPPIR diamonds – a variety of type IIa diamond that forms at significantly greater depths than most diamonds. Crowningshieldite is a nickel sulfide mineral with a hexagonal crystal structure and can be regarded as the high-temperature polymorph of the mineral millerite. It is also the naturally occurring analog to the synthetic compound known as α-NiS. The mineral is proposed to have formed by alteration or chemical modification of originally metallic, polyphasic inclusions. These iron and nickel-rich metallic inclusions are the most prevalent type of inclusion found in CLIPPIR diamonds.